If you think the blanket barrel heater is a cool item to have for your products, there is still something else that’s even cooler than that. It’s the Power Blanket Barrel Heater Cover! The function is obviously the same with the blanket barrel heater, but it is to complement and to add acceleration of the heat-up process. The Power blanket barrel heater cover is 2’x2’ in dimension and can be wrapped in a power blanket barrel heater for maximum effort of initial heating. It covers even several buckets at the same time! With 120 voltage and 90 watt power, this barrel heater cover is perfect for other types of applications, too. Even the personal ones. 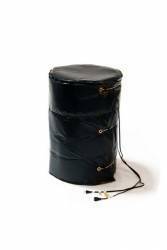 Use it to heat your drum lid, to warm your foot, tire, epoxy, and to function as under-desk heater. Have PowerBlanket Barrel Heater Cover at your workplace as well as at home and enjoy the warmth it transfers.